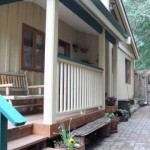 We are located on beautiful St. Mary Lake on Salt Spring Island. We have 9 cottages on 3 acres of park like setting with a private sandy beach, you will find it a great escape from your daily stressful duties. Enjoy the warmth of summer days, the romance of autumn evenings, the magic of an intimate cottage and fireplace on a winter night, and rejoice in the splendour of the spring flora. We invite you to be our guest. We are a family oriented resort. All the cottages are fully equipped with cooking facilities, televisions with cable, free Wi-Fi, bedding, towels and propane barbeques. There is a cottage on St. Mary Lake waiting for you.